I began cleaning and preparing diets. Looking back now, I was painfully slow, but at the same time I am really proud because I know how much progress I made by the end. I loved my birds. The mammals we’re not as exciting to me after all. Most of them were nocturnal and grumpy, or a higher level I couldn’t work with. I will admit, about half way through the summer I HATED it. I was miserable. I came home every day feeling like I couldn’t do anything right, covered in animal crap, sweaty and exhausted. I barely had the energy to eat and shower before I collapsed into bed. I was adamant I would never work in another zoo again. But then something clicked. I began getting better reviews. I could clean my section in half the time it took me when I started and I could finish diets in under 45 minutes. I was improving, not to mention so was Serena. Serena was my training project. She was the most beautiful bird they had, in my opinion. 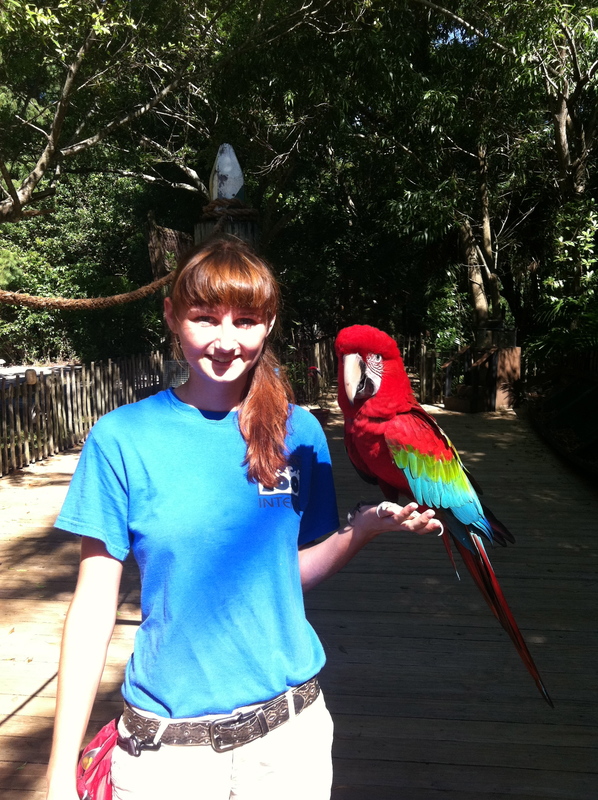 A big, gorgeous, young Green-Wing Macaw. She hadn’t really been worked with much by anyone other than my supervisor, and even most of the work she had done with her was a while back. I started with training her to get on a scale, so her weight could be taken every day. That only took a few days, once we realized she liked the flat scale, not the perch. Then it was on the stepping up on my hand. That took weeks. It felt like years. We would make the tiniest progress in daily sessions. We were both unsure of each other. 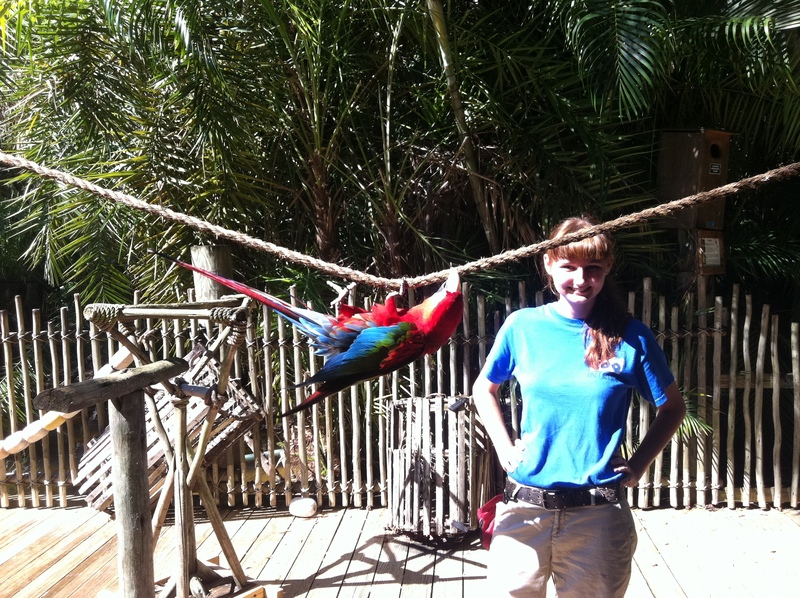 I mean, have you ever seen the size of a green-wing macaw? They’re huge! Once she began stepping up we worked on flying her from one person to another, in a flight cage. This was in the mean time until I could think of a behavior to submit to teach her. After searching youtube endlessly watching other zoo’s bird shows, I realized macaws didn’t do much other than fly from place to place. I wanted her to do something different, but it still had to be naturalistic. I taught her to climb on a rope upside down back and forth. Everyone thought it would take her a while, but she mastered it in about three training sessions, much to my eye rolling when I remembered just how long it took for her to even climb onto my hand. By the end of the summer I was sad to leave all of my friends, human and animal, but I was going back to Texas, where I had applied for my first paid zoo job at the Dallas Zoo.